Inspired by traditional Tuvan milk vodka, this hand-made vodka is triple distilled from pure milk sugar and Vermont spring water. Crystal clear, smooth and with a delicate nose, this vodka is excellent straight and chilled, perfect in a white Russian. After a year and a half of designing, building and perfecting, the distillery burned to the ground the night before their first delivery. Daunted but not defeated, they rebuilt the distillery, this time with more efficient stills and a wood-fired steam boiler for power. 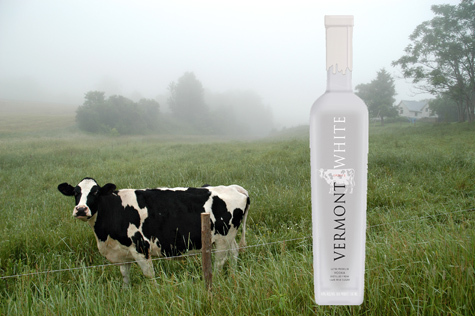 Within six months they were distilling again, and in August 2001, Vermont Spirits made its first appearance in Vermont liquor outlets. Tuvan milk vodka is mighty obscure; good luck finding any information beyond this. To go with the White, Duncan’s also has Vermont Gold. It is “Distilled from 100% Maple Sap.” Sounds expensive. Filed Under: vodka Tagged With: dairy, ingredients, unlikely combinations, wholesome, would you drink it? They are doing the same in England, Black Cow vodka is made from milk. you guys doing good job. I am from Tuva. This is the traditional drink of Tuvan nomadic people from ancient times. alcohol is only 20-25% in our drink, very smooth to drink, tastes like milk. Use of milk as a base for distilling has been going on since the monks trying to create a fortification of troops in the Russian provenance side 12bc. I should know… If you would like to know, contact me and I can help. Unless you know it all…lol.